The Role of sitemap in Search Engine Optimization is like the spinal cord. Every Web Design or SEO agency built and submit a sitemap to the webmaster and will consider this to be the first step towards SEO Campaign. Many clients will see a boost in traffic and better SEO results shortly after submitting a sitemap to search engines. So today I am going to tell you about some WordPress Plugins through which you can easily generate both XML and HTML sitemaps in just a few clicks. I hope you fill find them useful! But before knowing about those plugins let us see what is a sitemap and why the matters in SEO? Sitemaps are XML or HTML files that list out every single URL on your website, along with important metadata for each URL that includes when it was last updated, how relatively important it is within your website structure and how often you make updates to it. Sitemaps are a core piece of a website and are considered as a must in search engine optimization. XML sitemaps allow search engines to easily crawl a website and index each page so that it appears in search engine results. HTML sitemaps are also important and are more geared towards human users. They help your website visitors more easily find the content they’re looking for on your website. Their website uses a lot of rich-media content. I am sure this is enough to know why sitemaps are very important for our site. Here are some of the Sitemap generating plugins which you can use for your WordPress website or blog. So find anyone suitable for your site and install it in just a few clicks. If you want your site to quickly index in search results than this Plugin is for you. It just creates a sitemap ones you install it and activate it. This sitemap can be used in all search engines like Google, Yahoo, Bing, Yandex etc to index better your blog posts. Using this plugin makes easier for the crawler to view the complete structure of your website to index effectively. This is one of the best plugins for SEO and with many its SEO features this plugin also provide an XML sitemap. If you are using this plugin then you don’t need any other XML sitemap generator. All you have to do is to just enable the sitemap by going to SEO >XML Sitemaps check box to enable the Yoast XML sitemap. This plugin is specially made for generating an XML sitemap for Google webmaster tools. You can also control what you want to index in search engines from this plugin like categories, posts, tags, pages, gallery, etc. The ability to add the sitemap URL directly in the robot.txt file from the plugin’s settings page. Yet another easy to use plugin, which automatically generates XML Sitemaps for your WP blog and also knock the search engines when they’re updated. Contrary to other sitemap generating plugins, there is no settings page for that plugin because it works automatically. The pings occur automatically on an hourly basis if the sitemap file is updated. Unfortunately, this Plugin didn’t update for last 2 years. The plugin adds an HTML sitemap of your blog pages, not the posts just after installing and activating HTML Page sitemap plugin. And then entering the shortcode [html_sitemap] in the page. The drawback of this plugin is that it won’t create a sitemap for posts and it is just limited to WordPress pages. If you are using WordPress SEO by Yoast Plugin as your main SEO plugin, this is the best match for SEO Yoast to generate HTML sitemap. 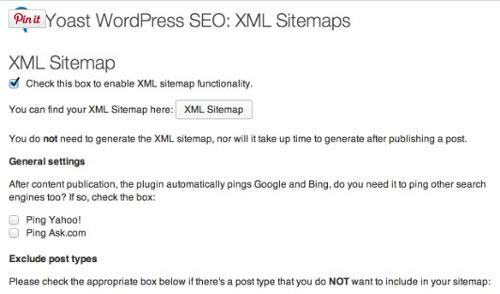 It will automatically use all sitemap XML settings from the popular WordPress SEO by Yoast Plugin. It is fully responsive and its HTML code has passed W3C Markup Validation with 0 errors. Same like WP Html sitemap it also generates a shortcode ([kwayy-sitemap]) which needed to be used in the page to show the complete posts and pages in only one blog page rather than adding the URLs custom. Unfortunately, this plugin also didn’t update for last two years. This plugin generates both XML and HTML sitemaps for your site dynamically. So you can enjoy both XML and HTML in one package. So this 2 in 1 plugin is both for Webmasters and Users. This sitemap plugin generates sitemaps which are multisite and multilanguage compatible.